Try this crispy chicken recipe because it is not fried chicken, it is baked chicken and so much healthier. The flavor is still there but all the calories are not. What a wonderful delicious and easy to make comforting meal. To make it even crispier and juicier read the suggestion below. The morning before you want to impress your family and friends, get a bowl that will hold all of the chicken. You may also use an resealable bag. Put 1 quart of warm water in the bag or bowl with 1/4 cup regular table salt and let it dissolve completely. Put on a plate or in a dish, add the chicken, shake and seal and let sit sit in the refrigerator for two hours. In a hurry? Use 1/2 cup regular table salt and brine for 1 hour. Remove from brine and discard. Rinse the chicken and place on paper towels and pat to dry completely. Preheat the cast iron pan on medium heat and preheat the oven to 400 degrees. Rub chicken pieces completely with oil and when the pan is hot place the chicken pieces skin-side down in the cast iron pan. Sear the skin on all pieces for 3 to 4 minutes or until crispy and golden brown. Turn the pieces over so it is skin-side up. 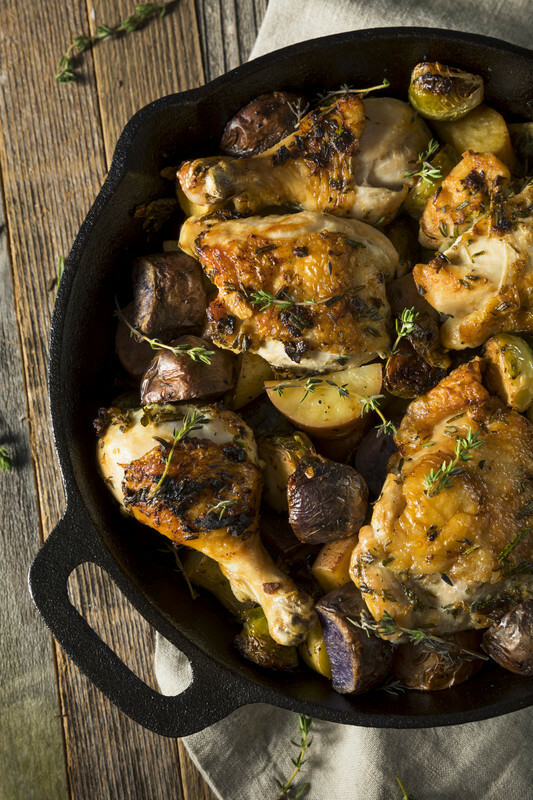 Put cast iron pan directly in the oven and roast chicken with fresh herbs if you wish for 35-40 minutes or until breast meat reads 160 degrees. Around the 20 minute mark, lift a piece of the chicken and make sure the bottom is not burning. Bring cooked chicken out of the oven and let sit for 10-15 minutes. You may roast Brussels sprouts, potato and onion wedges during the last 25 minutes of roasting. Rub them with oil before placing in the pan. Serve with rice or mashed potatoes. You may use a whole chicken but 4 pounds is the maximum I would use.